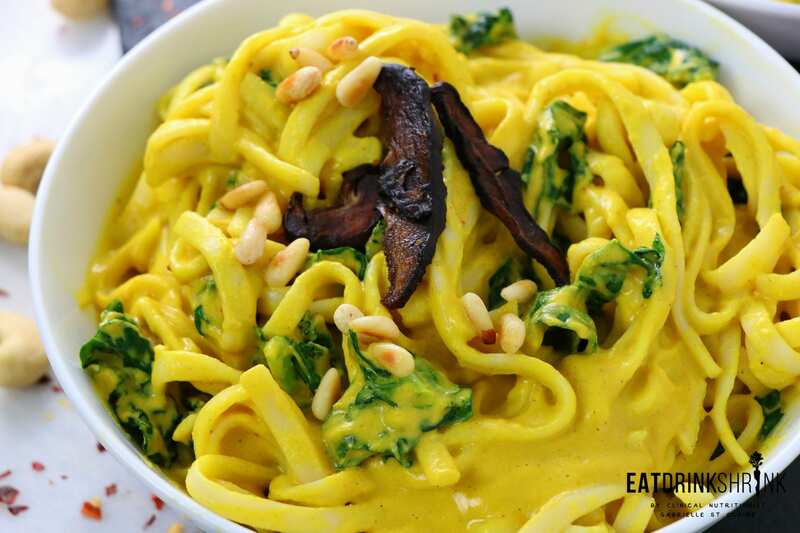 Vegan Pumpkin Pasta with Kale and Shiitake Bacon - Eat. Drink. Shrink. 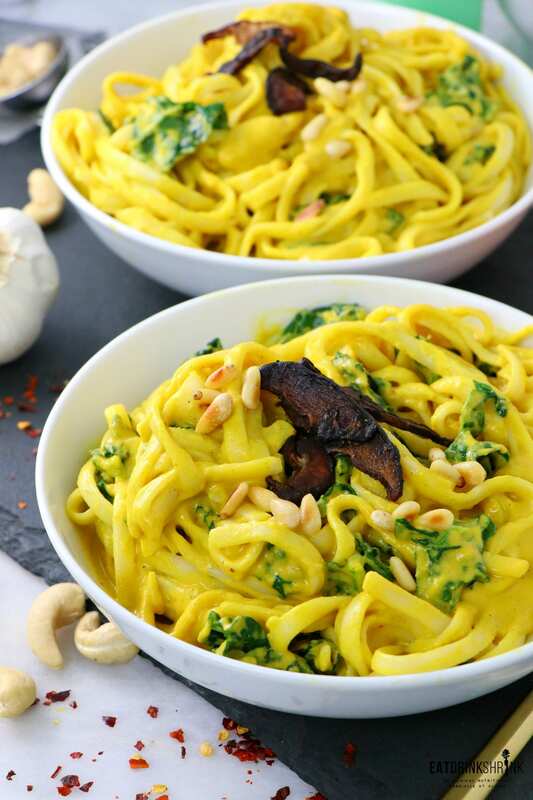 If there is one dish I’m forever enamored with, it’s this vegan Pumpkin Pasta! Although I created it a few years ago, it holds up and is one of my go to’s during the fall season! 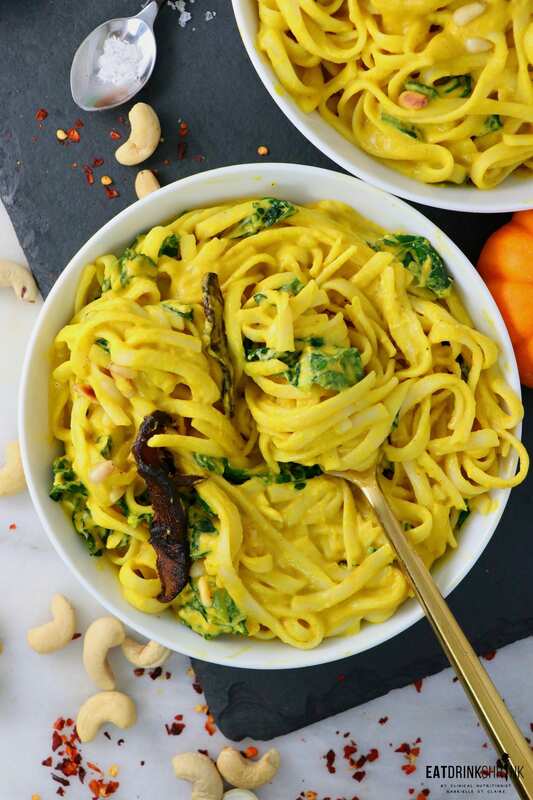 While I love actual homemade pumpkin pasta, this is a quicker alternative that’s veggie packed and offers the same great flavor! When it comes to pumpkin concepts, I really love the savory recipes as they stray from the normal cookies, cakes and breads. 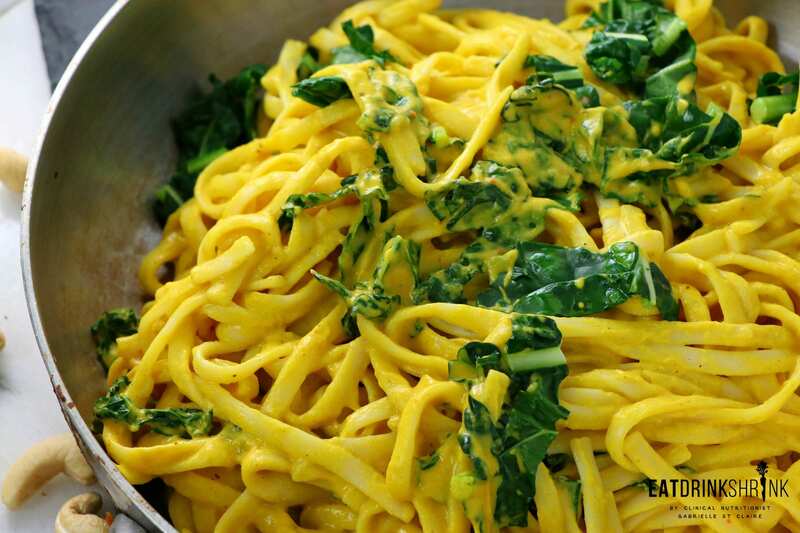 Pumpkin has a slightly sweet flavor, so when you combine with savory ingredients the flavor becomes all encompassing. A little savory, a lil sweet, and all around my cup of tea! What’s fab about this dish, is everything. 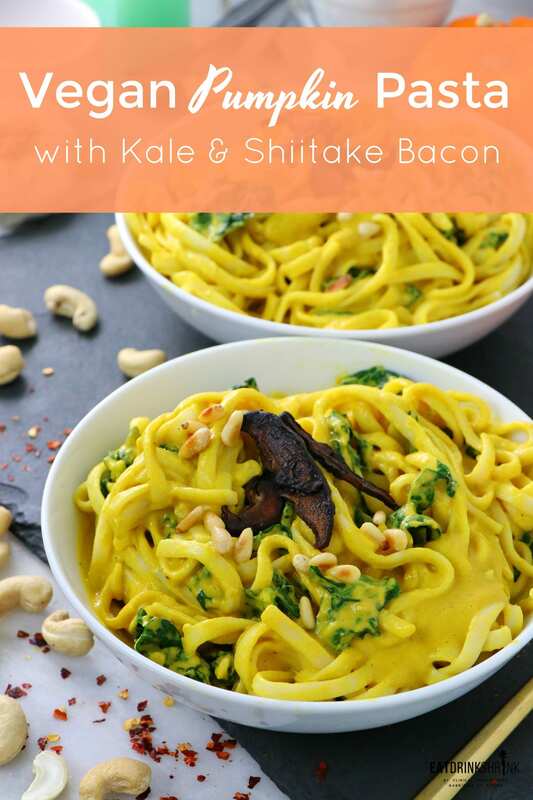 The aesthetic appeal screams fall weather, the ingredients are staples and affordable, it packs tons of kale, no dairy, the pumpkin gives a sweet flavor, the shiitake bacon a savory component, the cashews add a richness to the sauce, the white wine puts it over the top, it’s perf for fall, and can easily be made in bulk! 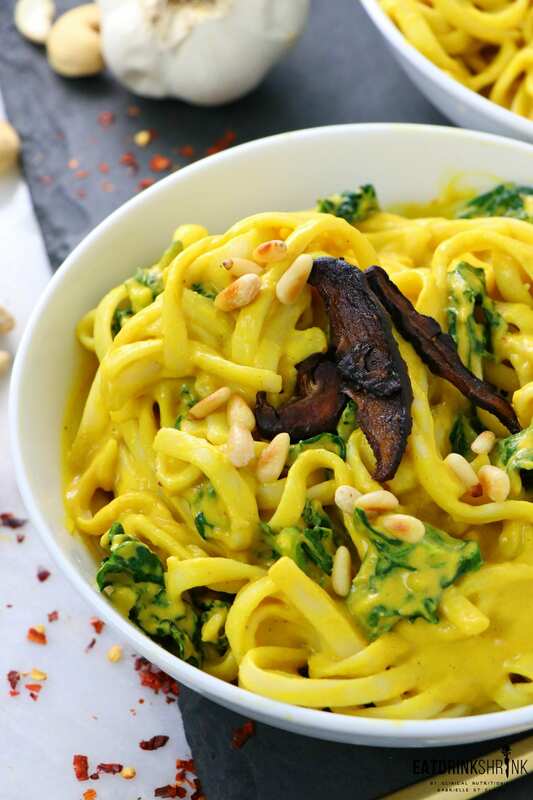 If there is one staple fall dish you need to explore, it’s this ,vegan Pumpkin Pasta with kale & shiitake bacon! Bring a large pot of salted water to a boil. Cook the pasta according to package directions, until al dente. Meanwhile, in a large skillet, heat the olive oil and vegan butter over medium heat until the butter is melted. Add the shallots, garlic, sage, pumpkin spice, red pepper flakes, and salt/pepper. Saute for 3-4 minutes, or until shallots are translucent. Add in the white wine and cook for 3-5 minutes until slightly evaporated. Add in the pumpkin, and saute for 1 minute, stirring constantly. 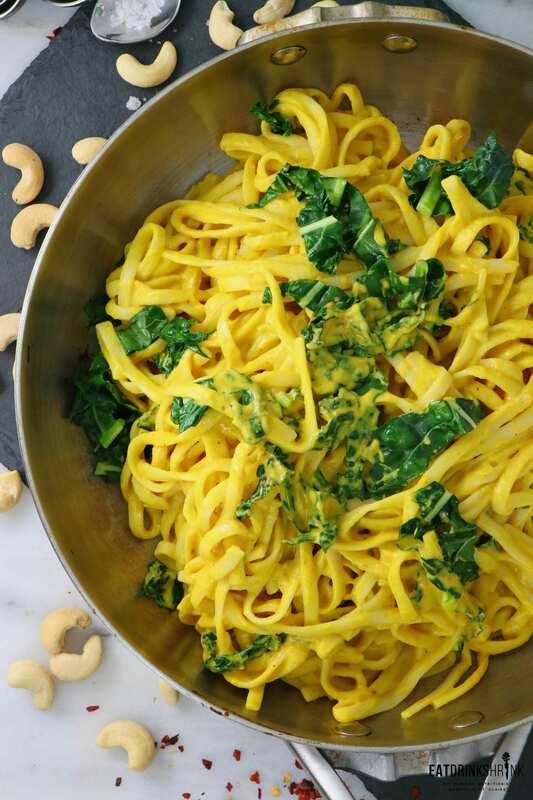 Remove from heat and throw in a blender with the soaked cashews, almond milk and blend until smooth. Pour back into the pan. Stir and simmer for 5-7 minutes until slightly thickened. Stir in the chopped kale and simmer for 2-3 minutes. Season with salt and black pepper.